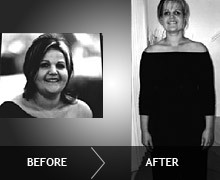 After seeing more than 20,000 clients over 30 years, I (Caron Milham) realised that a lot of people, by the time they had consulted with me, they had spend several years of their life in the process of the ‘yo-yo’ syndrome, having tried meal replacement powders, mass weight loss centres, weekly weigh-in meetings, appetite suppressants and self imposed starvation diets. They were often very unhappy, had a low self-esteem and often ended up bigger than when they first started dieting. I developed the chooz to looz program for people who have ‘been there and done that’, felt that they are the ones that have failed, when in fact it is probably their diets that had failed them. Firstly, our mission is permanent weight control. To help people stop, once and for all, the all too common “yo-yo” like syndrome (ie: repeated weight loss and weight gain) year in, year out. Our programs not only focus on the mechanics of weight loss, such as diet and exercise, but we work with our clients on the psychological reasons behind positive and negative eating habits and health management. Our philosophy is not about helping you lose weight quickly, just to have you put it back on when you finish the program. Our programs will teach you how to develop a healthy lifestyle and provide you with the support you need to manage and maintain your ideal weight, permanently. Secondly, chooz to looz is effective and safe, as the program has been developed by a qualified, experienced Dietitian and offers up to date, professional knowledge. Thirdly, chooz to looz can be tailored, to suit the individual, to ensure results and personalised care and that the program is easy to follow and convenient. We achieve this by the fact that everybody can personalise their menu plans to suit their needs, hunger levels, lifestyle, tastebuds, eating habits and usual meal routine. The Chooz to Looz program is available as individual consultations at our clinics or by correspondance (at home, via skype or phone consultations). If you prefer (and can attend) individual consultations with the Dietitian, then you can participate in the chooz to looz® program by attending appointments at our clinics. For further details on this option, please click here . If you have extras cover, with most private health funds, you will probably be able to attract a rebate for these consultations. This Chooz to Looz program option is a convinient, economic option for many people who lead busy lives and/or want to save money or time travelling to a clinic. It is also the option to chose if you live outside of South Australia. Some of our clients even live on the other side of the world! Firstly, you will have your comprehensive dietary and lifestyle assessment. Before your fully qualified Dietitian can devise your personalised program, and chooz to looz Menu plans and your first goal weight, the Dietitian has to assess fully your weight history, current dietary intake and lifestyle, attitudes, individual behaviours, family eating habits, hunger level variations, food preferences, and the environmental and your emotional influences on your food intake, together with identification of problem areas. Following your comprehensive assessment, the Dietitian will develop a nutritional weight loss plan and a personalised written menu plan and daily food guide, and this will be provided to you to suit your specific needs, hunger levels, lifestyle, tastebuds, eating habits and usual meal routine, as much as possible. Chooz to looz tools - including a weight loss chart to record your progress; food, exercise and mood record charts so you can track your progress and let your Dietitian know how you are going and a motivational fridge or pantry poster to help control emotional eating. For your economy and convenience all of the above will be done by email correspondence, in your own time, without leaving you home. You will then have a Phone/Skype consultation with the Dietitian to have your questions answered, discuss your progress and any problems you may have had. Your Dietitian will have your food intake (and/or other record charts) that you have emailed to her, prior your ‘appointment', to review, before and during your consultation. Following this consultation you will then have the option to book further Phone/Skype appointments and access more Chooz to Looz products including books. For the Chooz to Looz (at home) Program simply complete the enquiry form on ourContact us page and request that you would like to enrol in our correspondence program and we will then get back to you so that we can complete your enrolment. What happens after I have enrolled in the Chooz to Looz correspondence program? After receiving your enrolment application, we will send you more details so that we can finalise your enrolment. Following this we will arrange your comprehensive dietary and lifestyle assessment. The dietitian will then develop your own personalised chooz to looz nutritional plan. We will then email your chooz to looz Starter pack including your Chooz to looz book ‘ Getting Started' and your dietitian devised program which includes your personalised menu plan and daily food guide and extra service information including your Phone/Skype Dietitian appointment details. Can I still do the Chooz to looz weight loss program if I have other medical conditions like diabetes, high cholesterol or high blood pressure? In most cases, yes you can, but it is best if you first check with our dietitian. Please complete our enquiry form on our Contact us page and give us more details. Phone/Skype consultations are a convenient, economic option for many people who lead busy lives and/or want to save time and money travelling to a clinic and/or who live outside of SA. Some of our clients even live on the other side of the world! Counsel you on many and varied areas that may be inhibiting you from achieving your weight loss goals. This is possible as your Dietitian will have with her, when you Phone/ Skype for your appointment; your personal file, a copy of your dietary program and menu plans, and recent copies of your food records if you are keeping them. Food records can be emailed to us prior to your Phone/Skype appointment. How do the Phone/Skype consultations work? You can make your appointment, at any time during the week (including after hours) and you can choose the intervals between your appointments. We recommend fortnightly appointments to begin with, spreading out to monthly, as you progress and as you are feeling more confident, are progressing well and following your program. Chooz to Looz is different to all other weight loss programs around as it is long term, Dietitian designed and personalised, and it represents excellent value for money. Individualised, nutritionally balanced weight loss program including your Chooz to looz Menu plan and Daily food Guide devised to suit your eating pattern, lifestyle, food preferences, hunger level variations over the day and many other factors. You will also have an ‘Extras or Indulgence' allowance each week. This can include some of your favourite foods like alcohol or chocolate. After this, for further support with more consults and books, you can just ‘pay as you go', depending on how much support and information you want and need. For the Chooz to Looz (at home) Program simply complete the enquiry form on our Contact Us page and request that you would like to enrol in our correspondence program and we will get back to you so that we can complete your enrolment. 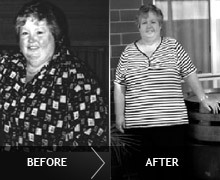 Chooz to looz e-book - "Getting Started"
I have lost 26kg in 10 months on the Chooz to Looz program. One of the most valuable tools for me has been the ‘Australian Healthy Shopping Guide', as I have been able to keep control of what I was eating and have the ability to choose healthy foods. 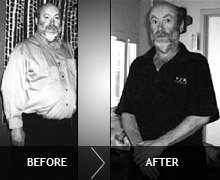 I have lost 15kg in 14 weeks on the Chooz to Looz program. The Australian Healthy Shopping Guide gave me a lot of information to help me to do my shopping and with choosing my foods. It gave me variety so I felt like I was never on a diet. I could plan my menus for the complete week. If choosing the correct food from the Australian Healthy Shopping Guide you will never go hungry. 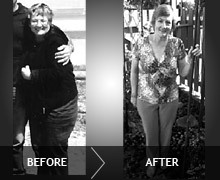 I have just achieved my goal weight and lost 10kg on the Chooz to Looz program. The book The Australian Healthy Shopping Guide has helped me to make better food choices. I love my food and with this book I can still do this knowing I have made the right choices. With this book I can repeatedly use it as a reference when needed. It is an essential part of my weight loss and ongoing weight maintenance and I wouldn’t be without it now. 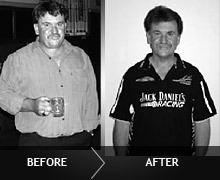 I have lost 45kg in 12 months on the Chooz to Looz program. I have found all of Caron Milham's literature helpful, especially the Australian Healthy Shopping Guide book. This book confirmed I was buying the right products and helped me buy different items that I was never sure about. My energy level is much higher, to a level I cannot remember it being before. I am now able to buy clothes 'off the rack', which I haven’t been able to do in 30 years. My blood pressure, blood cholesterol and blood glucose levels have dropped and no longer am I called ‘Borderline Diabetic’. I have lost 24kg on the Chooz to Looz program. I found the ‘Australian Healthy Shopping Guide’ book invaluable in giving myself variety in my food types and keeping true to exchanges. The Guide informed me of many labeling ‘traps’ and put me on the right track to making the right choices. I am a lot more relaxed now in food shopping, as the stress I used to feel is replaced by a confident attitude. 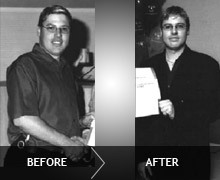 I have lost 20.5kg on the Chooz to Looz program and haven't felt this good in 15 years. The 'Australian Healthy Shopping Guide' has helped me very much with my weight loss and with 'shopping smarter'. I had no idea that what I was eating was that bad.